Don't let special memories slip away! It's remarkable how fast children grow, but saving a few bits of baby memorabilia can help you remember how you felt when you first brought your newborn home from the hospital. If you've been walking around in a sleep-deprived haze for the last few months, you may find yourself wondering what types of baby memorabilia are worth keeping. There are many different types of items you can save, but the trick is to choose only what has a deep personal meaning. Being a parent doesn't mean you must succumb to a house full of clutter! Saving just two or three things is fine as long as you've chosen them carefully. Many new parents find their mailboxes overflowing with cards and letters when they bring their child home from the hospital. Although it will be several years before your son or daughter is old enough to appreciate these sentiments, you definitely don't want this precious baby memorabilia to end up in the trash. To make a clever keepsake, consider snapping a picture of the sender of each card with your child during their first official meeting. Match the pictures and the cards together to make a simple, yet highly personal, baby album. Everyone knows that baby clothes are absolutely adorable! While it's probably not practical to keep every outfit your child wore, consider saving one or two of your favorites to use as keepsakes. The outfit your child wore home from the hospital, his or her baptism gown, or the outfit from your first family portrait session may be good possibilities for your treasure chest. 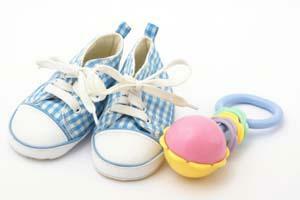 Don't forget to include the shoes and socks as well; memories of tiny baby feet are precious to any parent. If you're having trouble paring down your list of favorite baby outfits to a manageable number, consider taking pictures of all the outfits and making a small scrapbook album with the shots. It's not the same as being able to hold the garments in your hands, but you'll save yourself the trouble of having to store a closet full of boxes for the next 20 years! Every child has at least one special toy that he or she can't seem to part with. Whether it's a favorite stuffed animal, a rattle, or a puzzle, this item deserves a place of honor in your family's history. Don't forget that books can bring back powerful memories for young children as well. Even if your well-loved copy of Goodnight Moon looks like it has seen better days, the book is worth keeping if it brings back fond memories of bedtime stories and end-of-the day snuggle sessions. 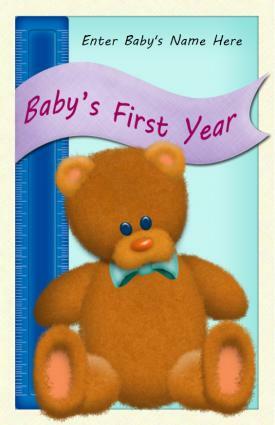 DIY Babybook - A babybook that you create yourself will hold special meaning for you and your child in years to come. If you have three dimensional objects to store, you can create 'pockets' in your baby book either by adding a half sheet of card stock to the pages to create an extra pocket. Scrapbook: If most of your memorabilia is relatively flat, you may be able to simply add the items to your child's scrapbook. Craft stores such as Hobby Lobby and Michaels Crafts have pockets and special page protectors that can be used to accommodate a variety of memorabilia. Memory quilt: Making a keepsake quilt can be a great way to save fabric from baby blankets and outgrown clothing. You can even use fabric crayons and iron on transfers to incorporate photos and small bits of handwritten text into your quilt. Shadow box: Making a shadow box can be a great way to display baby memorabilia, especially outfits, rattles, and other sentimental items with strong visual appeal. Time capsule: For a fun keepsake, consider making a small time capsule of baby memorabilia that your child can open on a predetermined date - such as the day he or she becomes a parent. Include a letter offering some of your best parenting tips and describing what each object means. For more tips on preserving your child's precious memories, visit LoveToKnow Scrapbooking.